I couldn’t resist including just one more anime episode (from one of my favorite series). Enjoy! The episode begins with reminiscing – Takumi thinks about Rika, and Rika and Shuji think about their past time together. Hagu, meanwhile, is feeling pressure to succeed in her art and becomes ill. Yuta helps her and finds out she’s been physically ailing lately because of the stress. Later, Shinobu, dressed as Santa, deliver invitations to a party on Christmas Eve. Yuta and Hagu go out to shop for the party, and he relates to her that he doesn’t like Christmas much, as he spent many of them in the hospital with him mom, a nurse. At the party, Takumi arrives late and speaks to Shuji about Rika, who is visiting her husband’s grave. After the party ends, Shuji takes the girls home, Takumi and Shinobu have a drink, and Yuta sleeps, dreaming of being young and celebrating Christmas with Hagu. For all the Santas I mentioned in these series of posts, might favorite is probably the mysterious (and hilarious) Shinobu Santa. There are also decorations, a Christmas cake, and a Christmas party. Oh yeah, and evil demonic Christmas trees that haunt Yuta’s mind. Yikes. Finding a bit of happiness in the hardships of life. I mentioned in my post about Toradora! 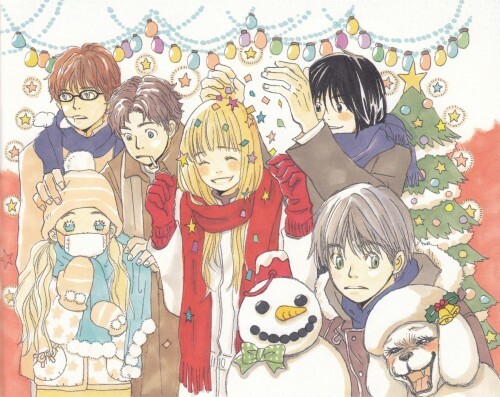 that it’s Christmas shows helped me think of those who weren’t having a Merry Christmas – Honey and Clover goes even further. Their characters are suffering from illness, heavy expectations, broken hearts, unrequited love, death of loved ones and the effects of growing up in a single parent household. Honey and Clover is about as realistic as anime gets, and that’s part of why it’s just so good. If you’re one of those without a happy home life, I hope that at least you had a bit of joy around Christmas. There is hope, and it’s found in the reason for the season. Honey and Clover might be the first anime that has ever made me cry. But it’s also one of my favorites too, isn’t it weird how that works? Haha, absolutely. If a series brings me to the edge of tears, I can almost guarantee that it’s a favorite. I’m all about the emotional investment. Honey and Clover is soooo good. Oh dear…I’m sorry to say I absolutely could not stand Honey & Clover. I sat through all of the first season and it was just…it was torture. It made me laugh sometimes, but for the most part I just wanted to slap every single character. Especially Hagu (though that was mostly because of her voice, not her personality). Buuuuuut…maybe you’re too young! 😛 It could be one of those series that grow on you over time. For instance, I hated Kare Kano when I first started watching it, despite everyone and their momma loving it. I’m planning on giving it another try in the near future, because I have a feeling I’ll like it much more this time around. I loved all of your 13 days of Christmas post~ I been keeping track since day one (I sound like such a stalker xD). And I enjoyed writing that section the most – I think it helped me understand the holiday a little better from the Japanese perspective, while also helping me see the idea of spirituality in some of the series better as a whole.